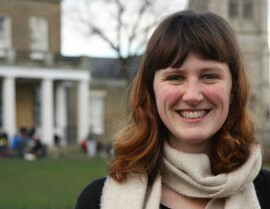 A FOOD-recycling campaign that could potentially save £1 million is being launched by Hackney council. Hackney residents throw 18,000 tonnes of food in the bin every year, enough to fill up London Fields Lido, pictured, every week, which would make swimming unpleasant. Yet it could all be recycled. 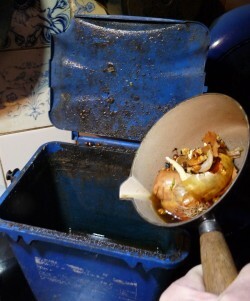 The council’s food recycling experiment wants people to take more care with kitchen waste and throw it into those dinkie free caddies it gives out. Actually, ignore that: the town hall doesn’t really want you to dump all your compost at its doors. It wants photographs. But it has organised a competition with a prize of £100. You have until Monday 15 December 2014 to try for that handy Christmas present. The council recycles the compost, eg, on the many parks and other green areas it owns. Naturally neighbourhoods councillor Feryal Demirci hopes the promotion will help to revive the recomposting scheme, so let’s hear from an opposition party. * The Charlotte George picture has been supplied. The others are by Loving Dalston. Really interesting project. Thumbs up from fellow recyclers! The Hackney council leaflet explaining it in simple and clear English came through my door today. Let us hope the scheme works this time. – Ed. This seems to be an interesting experiment, I only couldn’t really understand how the food will be recycled? Isn’t the composting enough? You’ve raised a good issue. My writer should have explained that the council recycles the compost, eg, on the many parks and other green areas it owns, a detail that has been added to the story. – Ed. Charlie, do you mean households or businesses? We do not force anyone into a contract – businesses are free to use any licensed waste-carrier to take their rubbish and recycling away. Perhaps some people are turned off recycling because when you sign up to it you are forced into a contract saying you will sort it all properly or risk a £1,000 fine. Take away the barriers and the ridiculous standover tactics and people might participate more.